Math Rotations or Math Workshop is a model of instruction where students are rotating between several "stations" throughout the math block. These stations are work stations that include working on a specific skill, working on classwork, meeting with the teacher for small group math instruction and having time to work with math with a hands-on approach. How do Math Rotations work? 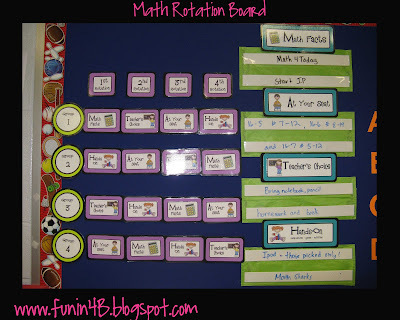 I use the acronym MATH for organizing how students "rotate" from one activity to the next. How do students rotate through the stations? Math Facts- During this rotation, my students complete their daily math spiral review. This is a daily spiraled curriculum reviewing all fourth grade skills. There are only 4 questions to complete, so when they are finished with that, they start their At Your Seat Work. At Your Seat- During this rotation, my students complete the Independent Practice from the math book. Prior to our math rotations, I teach a mini-lesson on the day's skill. However, you could have your students complete any independent work that you need for them to complete. Another option is to have your students complete the work with a partner or with a group of students. Teacher's Choice- This is my small group instruction time. My students are grouped into 4 different groups based on skills they need to review. I use the data from my spiral review to group my students based on the types of errors they have on the spiral review weekly assessment. Click on the picture to download it from Google Docs. Yes! When I group my students, I am able to differentiate their small group instruction and their hands-on review work. For example, if I see that a group of students is having trouble with subtracting, then their small group instruction will be geared towards providing them with some strategies they can use. They will also practice this skill during their Hands-On rotation. I use my Math Moves: Daily Spiral Review to help me group my students. You can find the 4th grade version by clicking on the image below. Currently, I have a 2nd, 3rd, 4th and 5th grade version of this Daily Review, in addition to bundles of these resources. If you'd like to find the others, you can find them in the description area of the 4th grade version. After several different attempts and finding the system that worked for me, I finally found one! I hope that you can use this information to help you find a rotation model that can work for you. Oooo love the acronym! Thanks for sharing - I'm going to check out the linky party! Awesome! Thank you for sharing your math centers! I teach 3rd grade, and I never do centers/groups because I have NO clue how! But now you've given me some ideas, so I can figure it out for next year. Thank you! I really like this idea. I was curious about how much time you get for math. Also, do you teach all of your skills in small group or is the small group extra?? I would love to give this a good shot in September! You have inspired me...Thanks! I love your organization of your stations... How do you grade the stations and the student work? When do you review this together - especially the Math 4 Today and practice pages? Once rotations are over, we come back as a whole group and go over all Independent practice and Math 4 Today. I just got you chalkboard gift in the mail! I love it, and its in my classroom now! I blogged it! I love this. What a great set up. I totally pinned this so I can come back to it again and again! I am SO going to do this next year! Question: How long is each of your station times? Usually about 12 minutes (give or take). OK - so 12mins per station, but do they have to wait until another group is finished with the materials of a "station" before they rotate to that station? I always have the one that just rushes and is done --do they move on or wait? What do they do during the wait time. Sorry for the bombardment. I love centers, but have yet to encounter someone that will share how they handle "problems" - talking off topic, too loud, early finishers, interupting teacher at small group table, etc. Thanks for sharing the acronym. LOVE it! Thank you for sharing!!!! Can I pin this?? I've been looking for an effective way to do math centers and this is it! I've tried this for the last two days and it is working out so well. I have given each group a folder for their math facts and at your seat work and it is going so smoothly! Thanks so much for sharing! Any idea how to make this work with 32 students in a class? I like the theory, I'm just not sure whether it's possible with my "regular' classroom. I have 120 minutes for math and science. We usually use 90 of that for math. Could I do a whole group instruction and then shorter math stations do you think? This way I could focus on the class as a whole and then break it down into my abilities as you said? Thanks! IS it possible to download the graphics that you created? I would love to use them if you wouldn't mind! Looks awesome! I am very intrigued! Thank you for sharing. I am a sucker for acronyms and organization! 2 questions 1) How do you differentiate? 2) When do the students work in pairs or small groups to explore/stretch understandings? Thanks again for sharing your great ideas! Happy to say I just subscribed to your blog. Thank you for sharing ~ it is inspiring! Great information! 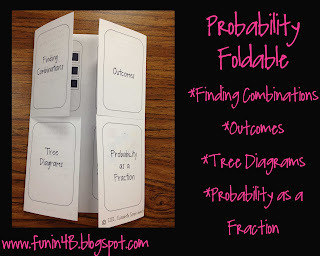 Thank you for linking this up on Math Monday Blog Hop! This is so great! Thank your for sharing and for explaining it so well. I am super excited to implement this in September! Thank you so much for explaining this rotation! I am super excited to implement it in my class this September! Thanks so much for sharing... I'm on my way to your other post on stations. I'm hoping I'll find a few answers to questions I still have. Thanks again. Love the flippable! Thanks so much! I converted it to a SmartNotebook version to do with my kids. I'd be happy to email it to you if you'd like. Thanks again! LOVE this idea. Any chance you can send out (or sell) copies of the cards for making my own display? Thank you for sharing this blog. I have a question though. How would you do rotations when you have 2 groups (a third and a fourth) in your classroom each math class? I do different lessons for each. I either have a high and low group or 2 middle groups. I want to incorporate rotations but am stressing on how to do it.